CEDIA 2015, Dallas, TX —The British manufacturer Flexson is showing off its comprehensive collection of Sonos accessories at CEDIA for people who want to better position their Sonos speakers in a room or to just give the speakers a unique look. Flexson’s stands and mounting brackets are particularly useful when you want to set up a home theater using a Sonos Playbar accompanied by a Sonos Sub for low-frequency effects and a Sonos Play:1, Play:3, or Play:5 for your surround channels. Flexson has two solutions for mounting a Sonos Playbar beneath a TV: The Playbar/TV Mount ($130 street) is an add-on bracket for existing articulated flat-screen TV mounts for TVs ranging from 37- to inches. If you don’t have an existing mount for your TV, Flexson’s Cantilever Mount ($400 street) will accommodate 37- to 55-inch TVs, allowing you to swivel the TV to best viewing angle, ensuring that the sound follows the picture. Flexson says a 40-inch display can rotate up to 180 degrees. 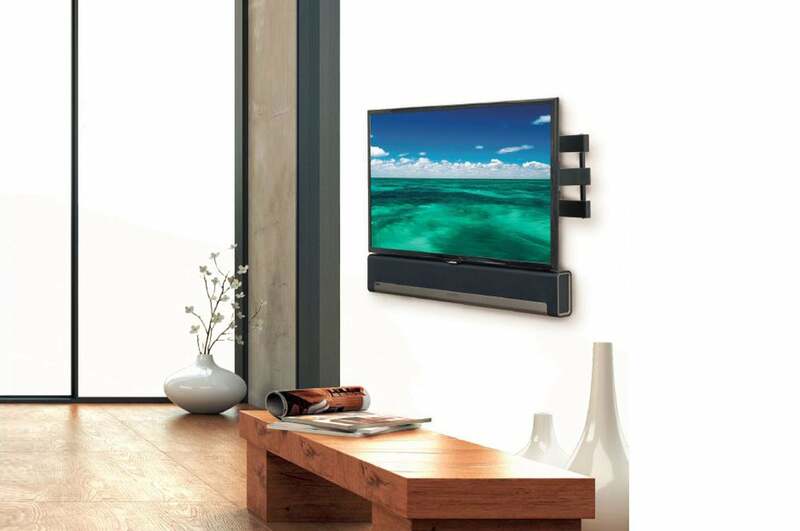 Hang your flat-screen TV using a Flexson Cantilever Mount, and your Sonos Playbar can go along for the ride. 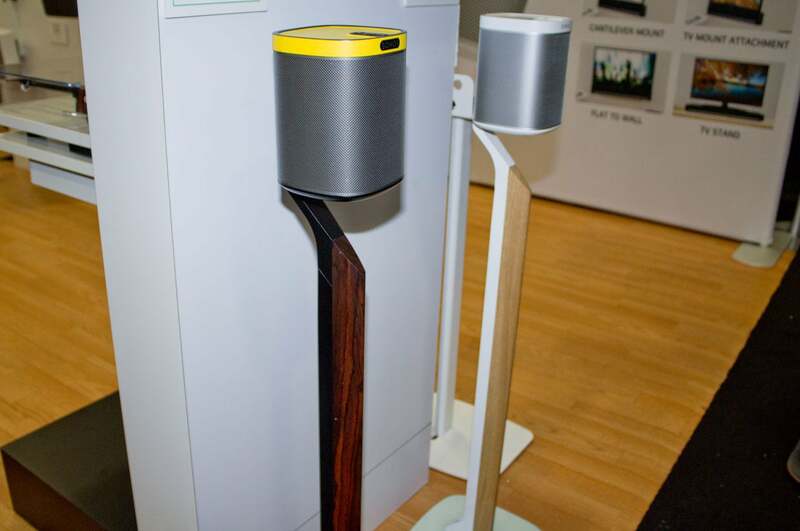 No matter which Sonos speaker you use for your surround channels, Flexson has stand to elevate it off the floor or. The Adjustable Floorstand for the Play:1 (there’s a model for the Play:3 as well) will let you raise or lower the speaker so that it’s at just the right height no matter how high or low the furniture in your home theater might me (the stand adjusts from 25- to 43.7 inches). Both models are about $200 per pair (street price). A non-adjustable stand for the larger-still Play:5 is street-priced $110 each, and Flexson Sales & Marketing David Cain told me that the company will have stands for the new Play:5 soon after that speaker starts shipping, thanks to Flexson’s close relationship with Sonos. Cain also told me that in response to customer demand, the company will soon introduce a new line of luxury stands. He showed me prototypes with English walnut trim. Pricing has not been set for these models. Flexson wil bring these wood-trimmed stands to market soon. Sonos gives you just two color choices with most of its speakers—charcoal or white—and its sub is available in just one color. 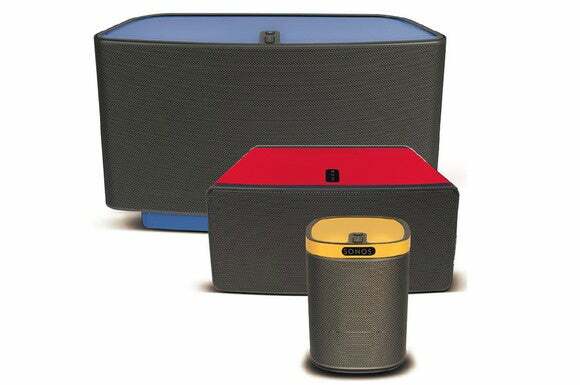 If you’d like to give their Sonos components a more unique look, Flexson developed a series of skins—called ColourPlay—that can change the color of the Sonos speaker. For the Play series speakers, you can choose from four glossy colors (Colbalt Blue, Racing Red, Candy Pink, or Sunflower Yellow) and one matte color (Imperial Purple). Flexson also has a skin that can change the Sonos Sub from black to white, and the Sonos Connect from white to black. I asked Cain if the skins would restrict the Connect’s cooling ability (while it doesn’t have an amp inside, it also doesn’t have a fan), and he said Flexson uses a breathable material, sourced from 3M, that doesn’t interfere with the Connect’s heatsink properties. He said he’s peeled the skin off the components after a full year and it hasn’t left any adhesive residue. Prices for the skins start at about $30 for the Play:1. Sonos says you can buy its Sub in any color you want, as long as it's black. 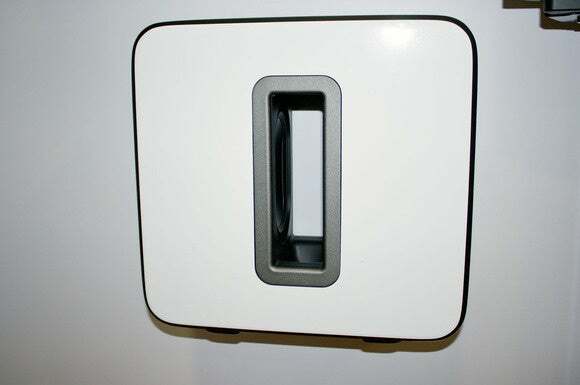 Flexson lets you turn the Sub white and mount it to the wall if you'd like. Flexson manufactures most of its Sonos accessories in the UK, but Cain said rising demand had recently forced the company to outsource some of its production to China. "But we maintain tight quality control over the factory in China to make sure they don't start turning out junk," Cain said.